Rabbi reads the last parsha of Deuteronomy (דברים) during our Simchat Torah service. Every year, TINT celebrates Simchat Torah! In addition to watching the consecration of our First Graders, worshipers roll out the Torah from start to finish. It’s a unique TINT tradition that gives everyone a chance to see our sacred scrolls up close and personal. The holiday service includes the reading of the last portion of Deuteronomy (דברים) and the start of Genesis (בראשית). In addition, Rabbi Matt reads from intermittent sections of each book, and points out where each book starts and ends. 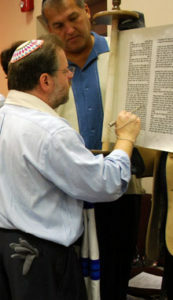 If you look at the picture on top of the page, you will notice Rabbi Matt pointing to a break with four blank lines. That is where one book ends and another begins. 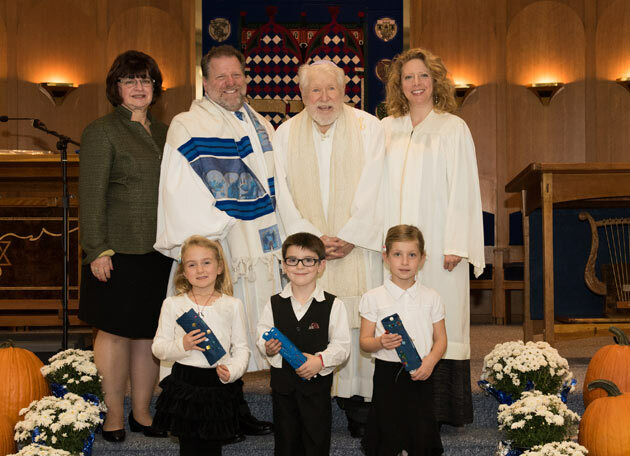 Celebrate Simchat Torah and First Grade Consecration with us on Friday, October 5, 2018. As always is our tradition, PB & Judaism followed the service.